M5 Internet Hosting Review 2019: Is M5 Internet Hosting a Good Hosting? Founded in 2001, U.S. based M5 Internet Hosting provides cloud and dedicated hosting servers to websites and applications that have high traffic or are in need of high functionalities. With services that cater to medium to large sized businesses and intermediate to expert web gurus, beginners and small businesses may find their services too complex or difficult to navigate. 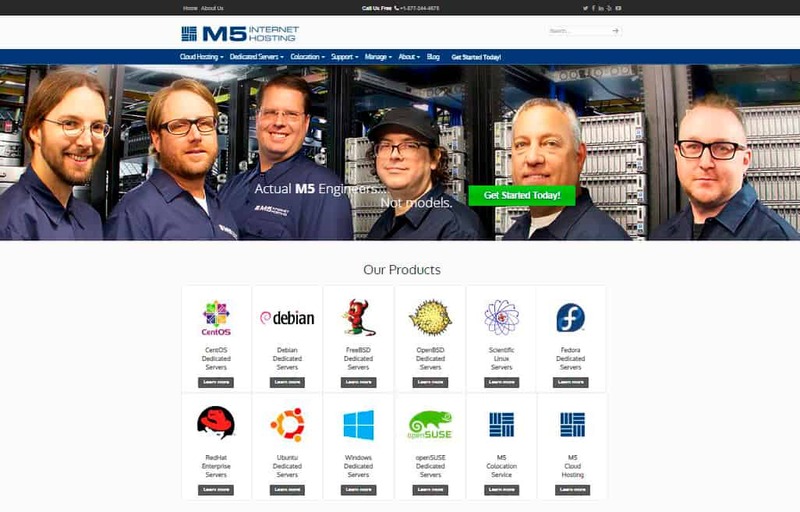 M5 Internet Hosting was established in 2001 to provide computer security consulting services and OpenBSD dedicated servers. Over the years, they’ve evolved to offer dedicated and cloud-based web hosting services that support FreeBSD and various distributions of Linux and Windows. Their two data centers in San Diego, U.S. cater to medium to large companies, and large web and mobile application needs. M5 Internet Hosting provides solutions that put the managing of your server in your hands while they take care of customizing the backend. You can get single entry-level servers, or a complex environment of hundreds of servers configured with custom routing, firewall configurations, and other advanced, custom settings. These servers are not intended for beginners or small businesses. I particularly liked their attention to security. They use encrypted physical disks with software that requires a hardware key. They also will not access your servers without your permission. Another plus is that all of the dedicated servers are pinged every five minutes to monitor their availability. You also receive quick alerts if any problems occur, which is unlikely considering their reported uptime. Also, you can track the status of uptime, bandwidth usage, and connections with web-based graphs that provide detailed reports. Numerous customers attest to that with some testimonies speaking of a 100% uptime. M5 Internet Hosting uses the Internap Flow Control Platform to monitor connections and increase your server performance by more than 50% when compared to regular dedicated solutions. A standard server in their data center comes equipped with your choice of processor, a 1U or 2U supermicro chassis, and a large RAM. M5 Internet Hosting is quite cheap for the functionalities they provide. Cloud hosting and dedicated servers are not always this affordable. Another plus is that you can use the customizable plans to get what you need and stay within your budget. They also provide a free one-month website transfer to another provider. So, if at any point you need more than they are able to provide, you can take your sweet time and move for free with their help. You can contact the customer service via email and a dedicated online ticketing system. Both work 24/7, and from experience, you’ll get a response within minutes. If that’s not enough, you can make use of their phone support, as well. M5 Internet Hosting offers a variety of cloud and dedicated hosting plans that you can customize to fit your needs and budget. While these services are suitable for big businesses and IT experts, beginners and small businesses may find them hard to navigate and excessive compared to their needs. Wondering how M5 Internet Hosting stacks up against other Web Hosting companies? Enter any other Web Hosting company and we will give you a side-by-side comparison.